What is the "Nevada Boater Education Card"? When will I receive my Boater Education Card in the mail? Is anyone exempt from getting the Boater Education Card? Q. 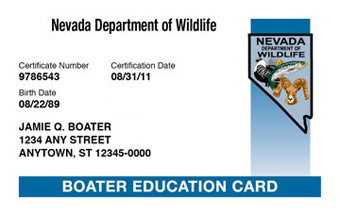 What is the "Nevada Boater Education Card"? A. The Boater Education Card (also referred to as the Nevada Boaters License) is proof of competency of the basic rules of the water that all boaters should know. The Boater Education Card must be carried with you whenever you are operating a powered watercraft to avoid high fines. Q. Do I have to get the Nevada boaters license? A.If you are born on or after January 1, 1983 you are required to get the Boater Education Card to operate any powered watercraft over 15 hp including PWCs on Nevada's interstate waters, including Lake Tahoe, Lake Mead, Lake Mohave and Topaz Lake. Q. How do I get my Nevada boaters	license? For a complete overview of the Nevada online boating exam process, please visit our Nevada Boating License Online Exam Process overview page. Q. What if I don't pass the Nevada Boating Test? A.The cost of the exam is $29.95. There is no cost to get your Boater Education Card which will be mailed to you home within 3-5 weeks. Boater Exam.com is a HACKER SAFE and Ambiron TrustKeeper certified site, ensuring that you are protected from over 99.9% of hacker crime. BOATERexam.com® uses an SSL secure connection with 128 bit encryption on any pages where personal or payment information is collected. Boater Exam protects credit card and order information in accordance with payment card industry best practices. A.The Certificate of Completion is a temporary proof of competency and proves that you took a boater education course and passed. Q. When will I receive my Boater Education Card in the mail? A.Your card will arrive in 3-5 weeks from the date you take your exam. A.The exam consists of 60 multiple choice questions. A.The passing grade is 80%, or 48 correct answers out of 60 questions. Q. Is anyone exempt from getting the Boater Education Card? A.No. If you are born on or after January 1, 1983 you are required to get the Boater Education Card to operate any powered watercraft over 15 hp including PWCs.